In my studies of the many different social clubs, fraternal orders, and civic groups that we as humans partake in, I have found a sense of pride in the fact that Oddfellowship still exists today! It might not be as prominent as the Masons and their appendages but indeed……still here. While membership is no where near what it used to be we are actually on the rise due to freethinking, adventurous, young bloods such as myself and the brothers who also contribute to this blog, accompanied by the wisdom and tutelage of our senior members who came before us….I am grateful for the brothers I have made in Oddfellowship especially within the IOOF being that I’m in the Grand United Order or GUOOF for short. I’m sure by now we all know the story but if not I’ll be glad to post again about our humble beginning in 1843.One thing I encountered is that in our current state, we are not where we would like to be……I’ve concluded that in 2017 both orders could use eachother for strength! I for one am all for taking our history seriously and never would my intention be to change the past (it’s impossible), but I am for creating a new pathway towards amity and truly living in the bond of Friendship Love and Truth! We can’t take those three words on face-value, we must represent them,embody them, live through them….How can we expect the world to take us seriously when we can’t get past visitation or even recognition? A proud Oddfellow should be exactly that….I am pushing to be the example of righteousness and voice of reason to whoever will listen but I am only one voice. I don’t wish to be a misfit or “odd” to the oddfellows but I believe that we have a chance to make a great thing greater by way of full-on interrelationships or knocking down the wall separating us . 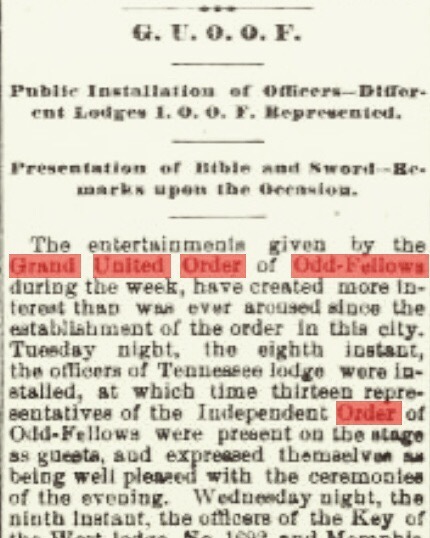 Although I am joining both orders, I can only dream for now of someday attending a lodge that says “American Order of Oddfellows” or “Grand Independent Order of OddFellows”……what say you fellows? It s a Grand idea! For our Solano County Fair in California, Im curating an information booth for IOOF. In my research, I discovered that the GUOOF had Golden Gate Lodge 2006 but I am unable to find where this California Lodge took hold. I would like to speak to fair goers about our interesting history, especially the great stories which illustrate our California grown character(s) and humor. I recently entered into odd fellowship (IOOF #38). Is there somewhere online I can learn about the differences between the two orders? Thank you for your work, brother! Welcome to the Odd Fellows! While there is no definitive source on the differences between the IOOF and GUOOF you can do some research of your own on archive.org which is a great resource for historical materials. The rituals, symbols, and regalia are somewhat different but still lead back to the same awakening to FL&T.